Remember a few weeks ago when Barrett Family Dental investigated ways to “protect your teeth from the sports you love?” Well… we just found a new study that sheds more light on the benefits of mouthguards– specifically custom-made mouthguards. The study, which was performed by General Dentistry, the peer-reviewed journal of the Academy of General Dentistry, followed players in six high school football teams. Half of the players were randomly selected to use a custom-made mouthguard, fitted by a dentist, and the other half of the players wore standard over-the-counter (OTC) mouthguards. All players wore the same helmets. What researchers found was– all other things being equal– the high school players sporting custom-made mouthguards were 50 percent less likely to suffer from mild traumatic brain injury (MTBI) or concussion. There are a few different variables that may contribute to this finding. First, custom-made mouthguards are fitted to the unique shape of a player’s mouth, and are therefore far less likely to be dislodged by an impact. Second, the custom-made mouthguards are far thicker than the OTC mouthguards (which are limited by their need to meld to mouths at temperatures that will not scald). This thickness provides greater protection from impacts and stabilizes the jaw and neck. Finally, custom-made mouthguards are far more comfortable. According to researchers, the thinner, more awkward OTC mouthguards are often “played with and chewed” by players, so not only are they offering less protection, they might not even be in place when that protection is required! 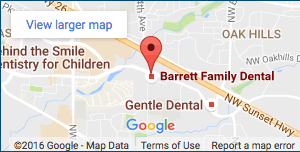 The team at Barrett Family Dental has years of experience forging the right protection for our athletic patients of every age. Your long term health is our top priority, and as an increasing body of studies continue to show the link between mouthguard use and brain protection, we are ever more committed to taking this step with our patients. Talk to us about custom-made mouthguards at your next visit with Dr. Barrett, the premiere dentist Beaverton Oregon has to offer. We’re eager to talk about your (or your child’s) options for optimal oral protection during athletic events.